I finished this last week and gave it to my mom on Sunday. She doesn’t like it. I don’t really know what to think about that. It’s not my most favorite thing I’ve made either, but I didn’t really use a pattern, and just tried to do what I thought would work with the print and the subject of the fabric she bought. She picked out the poky puppy and golden books fabric, I just added in some other things to fill it out. I asked her what she wanted me to do or how she wanted it to look, and she said to do whatever I wanted to, so that’s what I did. She said she thought I’d be using smaller pieces…what? 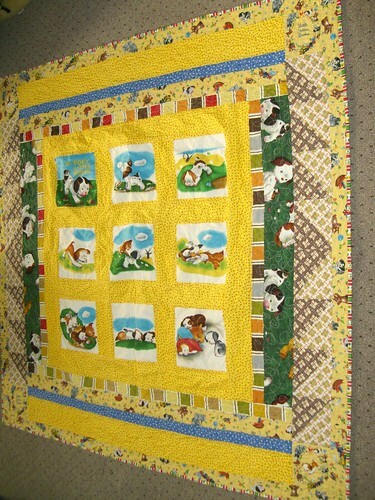 I used a fabric panel in the poky puppy line and cut the 9 blocks from it, I thought the whole point of her wanting to use this fabric was the puppies…the puppies on the green fabric were large too. I know the the fabric I used for the triangles doesn’t really look right with the other stuff once it was sewn together, even though it looked cute when the uncut fabrics were just laying together. 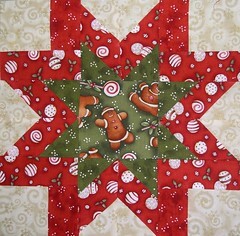 I know I could have done a better job on the quilting too. So it’s not like I am in denial about this quilt having problems. After I got over my initial indignation and hurt feeling, I thought about what she said about the smaller pieces and I think she wanted something along the lines of what I made for my goddaughter’s 1st birthday. 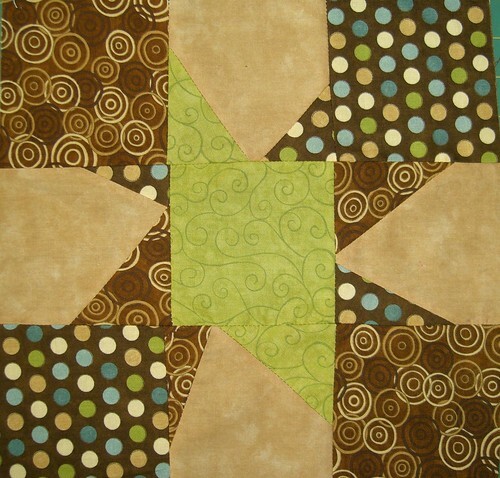 But a coin quilt with this fabric, and on a lap sized quilt just wouldn’t have worked, in my opinion. 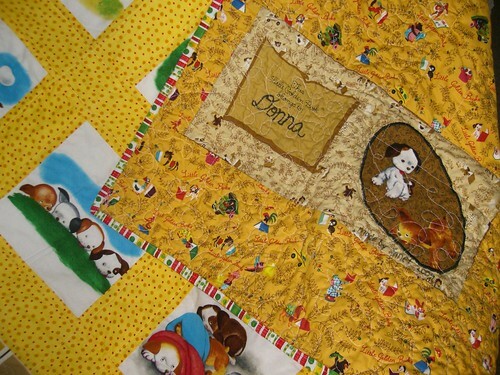 The golden book fabric would have been fine, but all the puppy-related stuff – you’d never see a puppy in there. 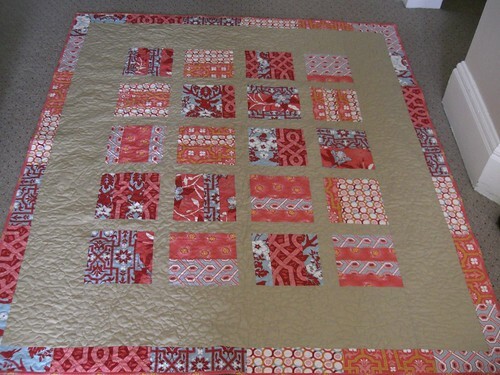 The other idea I had before going with this more traditional juvenile looking thing I came up with was to use those panels ask the center of some wonky log cabins and then use the other stuff she picked out as the strips and used the go-to white sashing. In hindsight, I probably should have just done that and gone with my instincts, but I second guessed myself that she wouldn’t like it because when I showed her the first wonky log cabin block I made – which I loved how it turned out – she didn’t seem all that impressed. She did like the back of the quilt. I used the book cover that was printed on the panel as the label and put her name on it. I also cut out some puppies from the panel and did my first applique. It ended up being not as hard as I had thought it was going to be. I was just intimidated by the satin stitch. Oh, well; you can’t win ’em all. Have you ever made something for someone who ended up not liking it? I’d love to hear your stories. The colors in this photo and the one of the back are more accurate, and I think it actually looks cute here. The nightmare quilt is finally done. 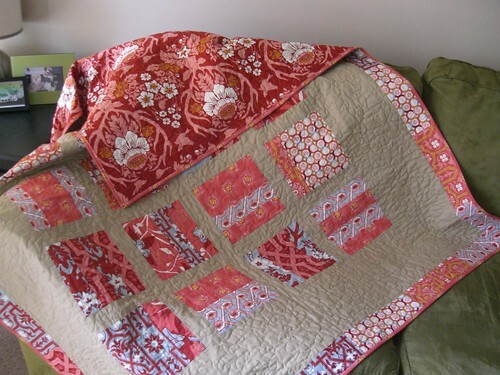 I am so glad I finally finished this quilt! I will be relieved when it finally makes it to its new home on Sunday, when I attend my cousin’s wedding. He and his fiance better like it! I want to thank Joann at Select Sewing Service for letting me come to the store the past two weekends to finish this thing. She taught me lots of helpful tricks and was so kind and understanding to allow me to come in and use their equipment when I was in a panic when my machine broke. I am so glad I bought my machine at a brick and mortar store! I’m happy with the decision to add the border, it was just a little too minimal for me without it. I decided to name it woodland mixtape. I even made sure I put a label on it, at my cousin’s request. For a guy, my cousin had pretty exact specifications! I always forget to add the label on most of my quilts. I should make an effort to include them. Maybe if I got that printable fabric, I wouldn’t be so lazy about making labels. 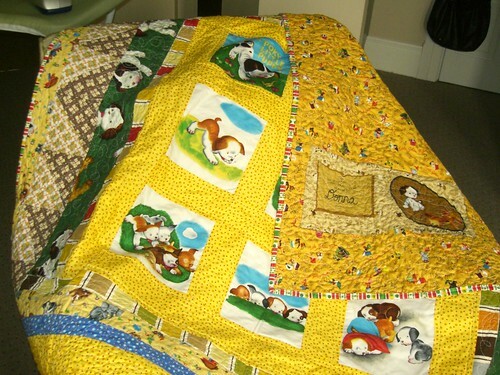 Oops, I remembered my mom’s Poky Little Puppy Golden books lap quilt request first. 😦 Hopefully it will be easier to make than this one was. I’m just going to freestyle a design that I can use the fabric panel on. It has each page of the book printed on it to make a soft book. They are 8″ each, so I wanted to cut them out and use them in blocks for this quilt. The rest I still need to figure out. I’ll work on that now and get everything cut out before I get my machine back, so when I do I can start working on piecing right away. 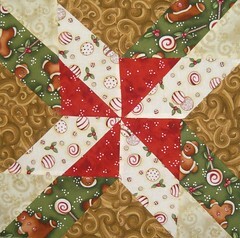 Hope my sewing machine is fixed soon! 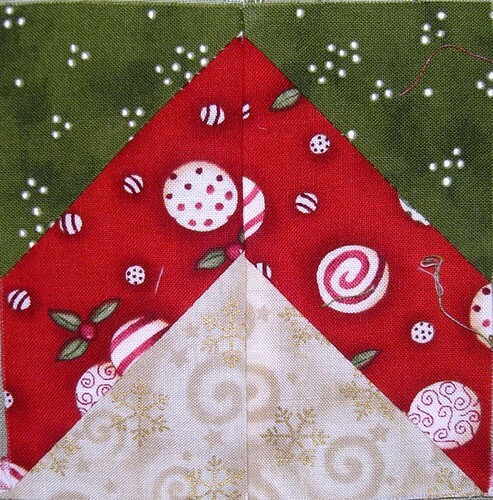 I’d like to get my Christmas project done before December 1!